- The field of telecommunications is developing at a rapid pace. The subject of this exhibition is familiar to us. We visit Bakutel every year. Today's exhibition has been well organized. In the modern world, Bakutel has become a popular meeting place for sharing experiences. To keep abreast of new technologies in the trend of developed areas and products, visiting exhibitions becomes a necessary visit. Here you can always get rich with very interesting information, get some knowledge. For example, we had a fruitful conversation with representatives of Beltelecom about the latest technology GPON. 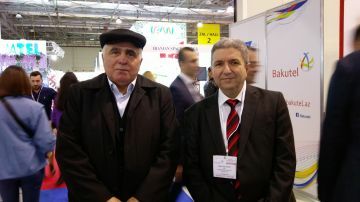 We would like to see at the exhibition even more eminent market players, to meet with their experts. We are confident that Azerbaijan will use their innovative services in the near future.